French President Francois Hollande has pledged that his country will “never yield” to “terror” while honouring three police officers killed during the attack on the Charlie Hebdo satirical newspaper, Al Jazeera reports. 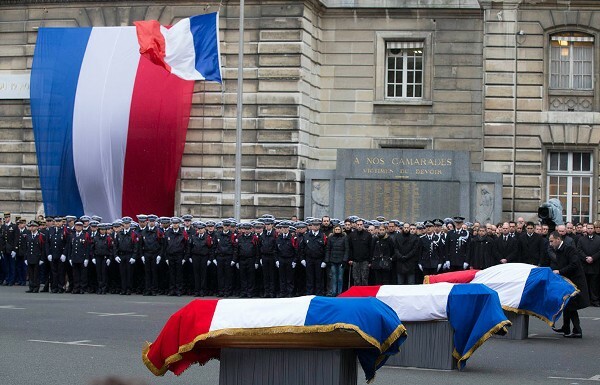 He pinned France’s highest decoration, the Legion of Honour, on coffins draped in flag of France in Paris on Tuesday as the Marseillaise anthem rang out. “Our great and beautiful France will never break, will never yield, never bend” in the face of the threat that is “still there, inside and outside” the country, Hollande said. Seventeen people, including journalists and police officers, died in the assault on Charlie Hebdo staff on Wednesday and in a bloody hostage situation at a Jewish supermarket two days later. Franck Brinsolaro, 49 and Ahmed Merabet, 40, were killed during the attack on Charlie Hebdo. The third police officer, Clarissa Jean-Philippe, 26, originally from the French Caribbean island of Martinique, was shot the next day when she arrived on the scene of a car accident in the southern suburb of Montrouge. Four Jewish victims of the kosher supermarket siege were buried in Israel on Tuesday. Thousands of mourners gathered at a cemetery in Jerusalem for the funeral of Yoav Hattab, 22, Philippe Braham, 45, Yohan Cohen, 23, and Francois-Michel Saada, 64, who were killed on Friday. Charlie Hebdo is due to publish a cartoon of Prophet Muhammad on the cover of its first issue in response to the attacks that were claimed to be “avenging the prophet”. The newspaper Liberation hosted Charlie Hebdo’s staff as they prepared the new issue. Up to three million copies of its latest edition will be printed, which is 50 times more than usual. The edition will appear on Wednesday in 16 languages, including Arabic, and will be sold in 25 countries. “It (the demand for the publication) is clearly an upswell of support for a publication which since its very foundation has had the principle of freedom of expression at its core,” said Al Jazeera’s Rory Challands, reporting from Bobighy, just outside Paris.